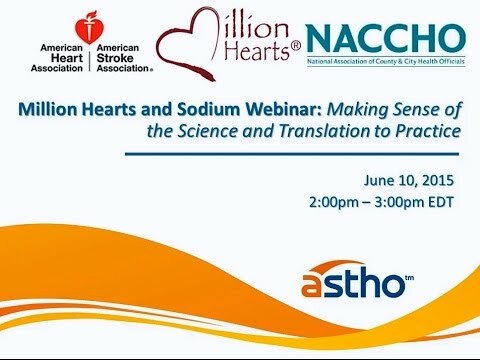 With support from CDC’s Division for Heart Disease and Stroke Prevention, ASTHO is working to engage state health officials in the development of a national strategy to improve the healthfulness of food served and sold across states, with a focus on reducing sodium and added sugar. Through a collaborative effort of public health leaders and private sector partners including food service management companies, ASTHO aims to support state health agencies and private sector partners, such as food service management companies, in creating healthier food environments in state owned and operated facilities, parks, worksites, hospitals, universities and other settings. To learn more about how FSMCs are improving the nutritional quality of food served and sold across a variety of settings, ASTHO interviewed national and regional FSMCs across the United States. These snapshots highlight different approaches food service operators are using to reduce sodium and added sugar in their offerings. They can help public health leaders and practitioners learn more about the range of FSMC nutrition initiatives, identify common goals across public health entities and the private sector, and consider opportunities for aligning efforts. Selrico - Selrico Services (Selrico), a regional, family-owned FSMC that serves government organizations, institutional facilities, and commercial companies, partnered with the city of San Antonio (TX) to address sodium levels and added sugars in prekindergarten and senior feeding programs. State health agencies can prioritize implementation of healthy food service guidelines, sending a clear message to partners and policymakers, and helping to address the challenge of messaging for consumers. From 2011-2015, ASTHO, with support from CDC's Division for Heart Disease and Stroke Prevention, led a technical assistance call series for 11 states aimed at building states' capacity for sodium reduction efforts. These sodium reduction efforts focused specifically on food service guidelines for foods sold and served by government agencies to improve the nutritional quality of food for state employees and state programs' clients. ASTHO developed state stories and a project summary to share results and lessons learned from the project. CDC’s Food Service Guidelines: Case Studies from States and Communities highlights five case studies of food and beverage guidelines developed to improve the food environment. The case studies provide information on the implementation and evaluation of food service guidelines, along with descriptions of site-specific successes and challenges. CDC’s Food Service Guidelines Highlights provide four states’ (HI, IA, KY, RI) efforts to implement food service guidelines in worksites through various mechanisms such as healthy vending programs and healthier meetings policies. 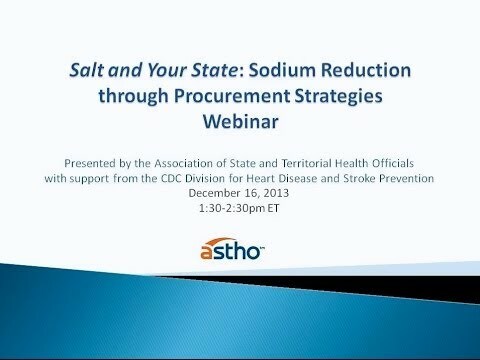 This document summarizes the results of ASTHO's 2011-2015 project, funded by CDC's Division for Heart Disease and Stroke Prevention, that provided targeted technical assistance to two cohorts of states, with 11 states total, aimed at building states' capacity for sodium reduction efforts. These sodium reduction efforts focused specifically on using government food procurement to improve the nutritional quality of food for state employees and state programs' clients. Participating states were Arkansas, California, Connecticut, Delaware, Indiana, Iowa, Massachusetts, Missouri, Montana, North Carolina, and Washington. The project summary provides a background of the technical assistance project, an overview of each state's activities, lessons learned, and a list of resources related to sodium reduction and government procurement. 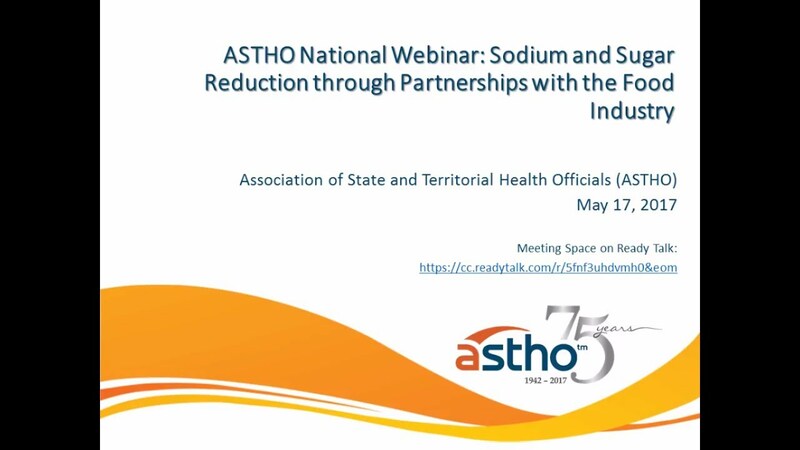 This webinar focused on states’ partnerships with the food industry to accelerate sodium and sugar reduction efforts. Sodexo and Compass Group, two major Food Service Management Companies (FSMCs), presented on their efforts to reduce sodium and added sugar across settings, successes and challenges encountered, partnerships with public health organizations and agencies, and ways FSMCs align nutrition standards with other contracts. The Connecticut Department of Public Health also presented on their current efforts and work, in collaboration with the Connecticut Bureau for Education and Services for the Blind (BESB). This webinar recording provides an overview of sodium reduction strategies in Alabama, Massachusetts, and Washington state. ASTHO also works with the National Salt Reduction Initiative spearheaded by NYC and has publicly commended the major food and restaurant companies that officially committed to helping people stay healthy by reducing the level of salt in their products. New York City's NSRI is a public-private partnership that was developed in conjunction with national health organizations years in order to set targets for sodium reduction in packaged and restaurant foods. Key players in the food industry, such as H.J. Heinz Co., Kraft Foods Inc., and Starbucks have committed to the voluntary initiative. In April 2010, the Association of State and Territorial Health Officials joined its partners in the National Salt Reduction Initiative (NSRI) in commending the 16 food and restaurant companies that publicly committed to helping people stay healthy by reducing the level of salt in their products. The companies have taken an important first step in an effort that could ultimately save tens of thousands of lives.